You can’t have street cred if you’ve never been in the streets. 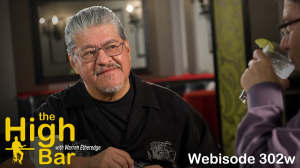 Luis J. Rodriguez has enough cred for Crips and Bloods to give the man his props, both as a former gang member and as… an award-winning author. Luis — whose books include the ground-breaking high school classic, Always Running: La Vida Loca-Gang Days in L.A. , and the new best-seller, It Calls You Back: An Odyssey through Love, Addiction, Revolutions, and Healing — gets his (non-alcoholic) drink on with Warren at The High Bar to raise a toast to and raise the bar for… the social order.